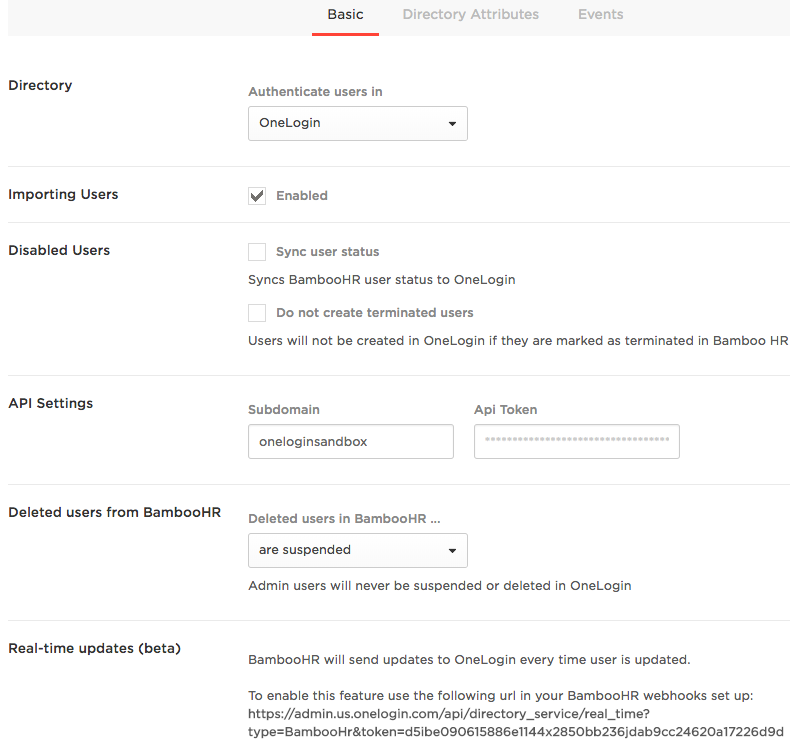 This topic describes how to import users from BambooHR to OneLogin using the BambooHR directory connector, essentially treating BambooHR as your user directory of record. Log into BambooHR as an administrator and get a permanent access token for the BambooHR API. To learn more about how to generate a permanent access token, see BambooHR API authentication documentation. Security Note. The BambooHR administrator account, used to generate the permanent access token, should have permission to view only the users and user attributes you want to import to OneLogin. Click New Directory and select BambooHR. Name the directory and select which directory you want to Authenticate users in. You can select OneLogin to manage user authentication (in which case you manage and store encrypted passwords in OneLogin), or you can select any third-party directory (Active Directory, for example) that you have integrated with OneLogin to store passwords and manage authentication. If you select another integrated directory, you must configure OneLogin to export new users to that directory. For more information, see the OneLogin documentation for your directory integration. To use this directory connector to import users from BambooHR to OneLogin, select Enabled under Importing Users (enabled by default). (Optional) Set your import and synchronization settings for users who are disabled in BambooHR. Sync user status: select to sync any user status changes made in BambooHR to OneLogin. Do not create terminated users: select to prevent terminated BambooHR users from being imported to OneLogin when you initially set up the integration. Enter the API settings required to connect to BambooHR. The API token is the permanent access token that you generated for BambooHR API access in step 1. Note: In the near future, BambooHR will use OAuth based authentication. Select what happens to a user in OneLogin when that user is deleted from BambooHR. Are suspended: user is suspended in OneLogin. Are unaffected: no change to user in OneLogin. Are deleted: deletes user from OneLogin. Note: Admin users aren't created in OneLogin if they are marked as terminated in BambooHR. Real-time updates pushes user changes in BambooHR to OneLogin, at regular intervals. For more information on Real-time updates, see Configuring BambooHR Real-time. Wait a few seconds for the authentication to finish. After a successful authentication, a green banner appears across the top of the page. A red banner appears if authentication fails. 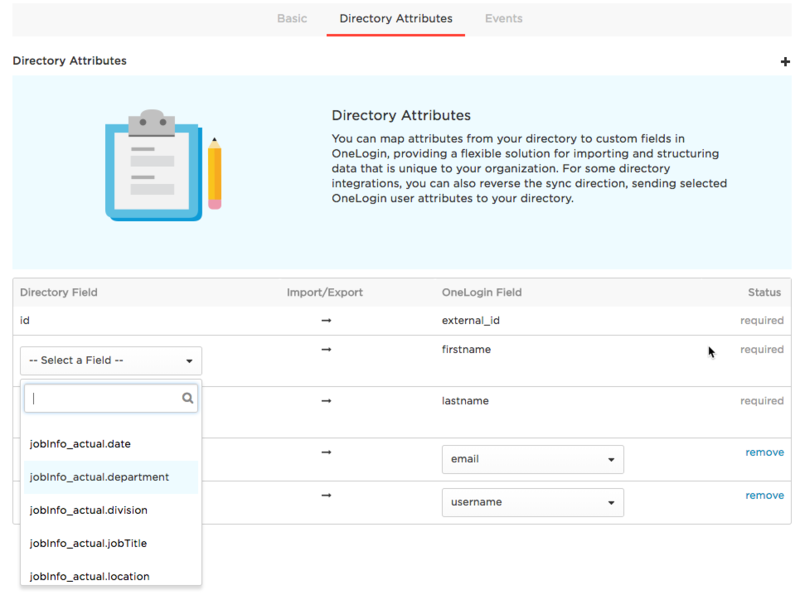 On the Directory Attributes tab, map the BambooHR fields that you want to import to OneLogin. Select the BambooHR field from the dropdown in the Directory Field column for each required field. The connector automatically pulls in all BambooHR fields available for mapping. Note: BambooHR requires that you map firstName, lastName, and either email or username, or a red error is displayed at the top of the screen. Click the + plus button at the top right to add rows, where you can map additional BambooHR fields to OneLogin fields. For any new mappings, you must create a OneLogin custom user field to hold the value you want to sync with the BambooHR field. All custom fields will be available for selection from the dropdown in the OneLogin Field column in rows that you add. Note: The selections emplyomentStatus and jobInfo in the dropdown list, and sub-selections like jobInfo_actual.jobTitle for example, reflect the user's current status. The previous values for these two selections are not exported into OneLogin. BambooHR Teams and Groups: OneLogin imports a user's BambooHR team and group memberships as semicolon-delimited lists. If you create a custom field in OneLogin for BambooHR teams and a custom field for BambooHR groups and map the BambooHR fields to those custom fields on this tab, you can then use BambooHR team and group membership to create mappings that assign OneLogin attributes, like Roles. You can also use rules to provision app attributes based on BambooHR team or group membership; for apps that support Group creation, you can even use rules to create a Group in an app (like Google G Suite, for example) based on a user's BambooHR team or group membership. For more information, see Mappings and Rules. Refresh Schema pulls any available fields from BambooHR and propagates them to OneLogin. If any fields were changed in BambooHR, use Refresh Schema to export them to OneLogin.